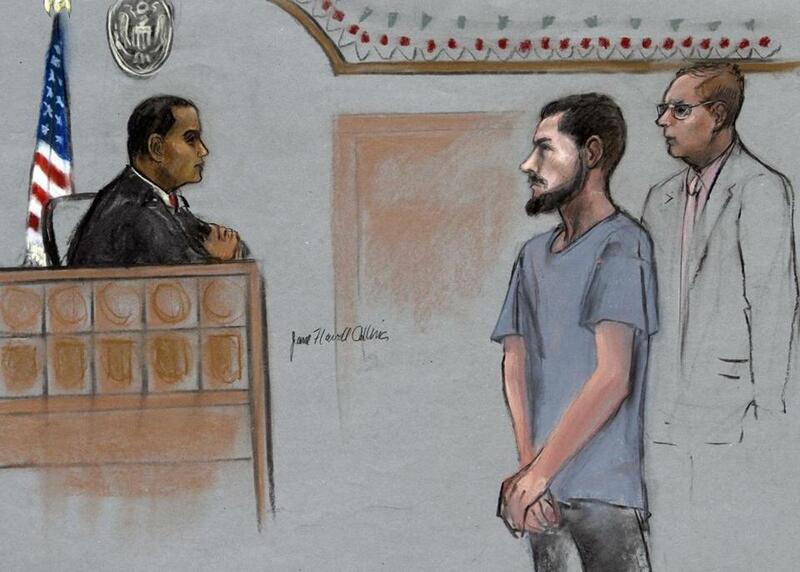 Nicholas Rovinski stood for a hearing in 2015 in this courtroom sketch. One of the men charged earlier this year with supporting the terror group ISIS and conspiring to recruit others to a “martyrdom operations cell” has agreed to plead guilty in federal court in Boston. Nicholas Alexander Rovinski, 25, of Warwick, R.I., was charged in June 2015 with conspiracy to support ISIS. He was later indicted on charges of conspiracy to commit acts of terrorism transcending national boundaries and obstruction of justice, and he faces life in prison. He is slated to plead guilty Thursday. The circumstances of Rovinski’s decision to plead guilty were not immediately disclosed. A hearing was set for Thursday, according to federal court records. Rovinski and another man, David Daoud Wright, 26, of Everett, were charged following the fatal shooting by police of Usaamah Abdullah Rahim, 26, who was Wright’s uncle. Authorities say Rahim attacked police in a Roslindale parking lot with a military knife when they sought to question him about a plot to kill police officers. Wright and Rovinski were ensnared in that investigation; authorities said they had also discussed a plan to behead anti-Islam activist Pamela Geller. A new indictment unsealed earlier this year alleges the three men tried to recruit members for their “martyrdom” operation. In March 2015, for instance, Wright allegedly drafted organizational documents for a “martyrdom operations cell” and conducted Internet searches about firearms, the effectiveness of tranquilizers on humans, and the establishment of secret militias in the United States. Prosecutors allege Wright also obtained a jihadist manual that detailed “how to become a sleeper-cell” in the West until ready to carry out an attack, according to the indictment. During that time, Rahim was communicating with ISIS members overseas, including Junaid Hussain. Hussain was killed in an airstrike in Raqqah, Syria, in August 2015. Hussain, an English-speaking ISIS member, had used Twitter and other social media to encourage supporters to carry out attacks in the United States and Europe against those who do not follow Islam. According to the authorities, Hussain had instructed Rahim to kill Geller in New York, and Rahim passed those instructions to Wright. Authorities also said that Rovinski has continued since his arrest to plot an attack and has written letters to Wright from prison, discussing ways to take down the US government and decapitate those who do not follow Islam.